During a recent debate with Jim Cooper, John Hutchings told a tale about why he isn't necessarily in love with the idea of county government becoming more representative. But, he get's most of it really really wrong. A little disclosure, I am a member of Better Thurston, which advocates for Home Rule and a charter form of government. So is Jim Cooper. 1. Hutchings says we would need to amend the comprehensive plan if we decided to have home rule. Just quickly, the comprehensive plan is a document required by the Growth Management Act, basically where certain buildings will be built and where people will eventually live. A charter is how county government is organized. The charter would also have a component of an executive manager for the county. And no matter what the people want and what the commissioners vote on, the executive manager, who is not an elected position would have veto power. And, I don’t think I like that because that takes what the peoples’ wishes are away from the people. First, in the charter process it is up to an elected group (a disappearing committee) to write a county charter, essentially a county constitution of how political power is divided up through the county. How many seats on the county commissioner? Is the clerk elected? That kind of thing. So, that anything at all (like a veto wielding bureaucrat) would be required is false. If you look at charter counties throughout Washington, you see a significant diversity of how they manage their own affairs. Whatcom has a non-partisan county commission with seven members and an elected executive. Both San Juan and Clallam stuck at three commissioners. King County has a nine-member non-partisan council. That said, Hutchings says that an executive manager could veto decisions by an elected body. So, more than a few of these charter counties did decided to go with a council or commission appointed administrator. This is, in fact, very similar to the forms of governments of Lacey, Tumwater and Olympia. The elected officials approve a budget and policy and the manager executes it. While this gives the administrator day-to-day control of the county government, they can not veto a damn thing. In American government terms, a veto is literally turning back a decision by the elected board and saying "nope, we're not going to do this." Veto power does not exist with any single unelected administrator with any local anywhere in Washington State. Seriously. Also, while the Washington State constitution envisioned noncharter commissioners as a cross between executive and legislative actors, Thurston County has in fact had one of these unelected administrators for decades. So, if elected, Hutchings would step into a power structure very much like the one he fumbled through describing. 3. I understand that the county charter process is complicated. So it makes sense that people oftentimes don't get the nuances. But, there's a reason why it's complicated. Its serious business changing our form of government. And, people running for office should be serious enough to understand it. This late in the game, you'd hope that a county commission candidate would have ironed out any confusion they had with the process. But, you know. I don't think Hutchings thinks he's wrong. I think he's pretty confident about his understanding of how the charter process would work. Listen to the confident way he explains his understanding of the relationship between a county manager and elected officials. He's trying to walk the listener through a complicated arrangement that he is just not getting himself. These aren't shades of gray either here, or things that honest people can disagree about. This is literally a question of elements of government existing or not. 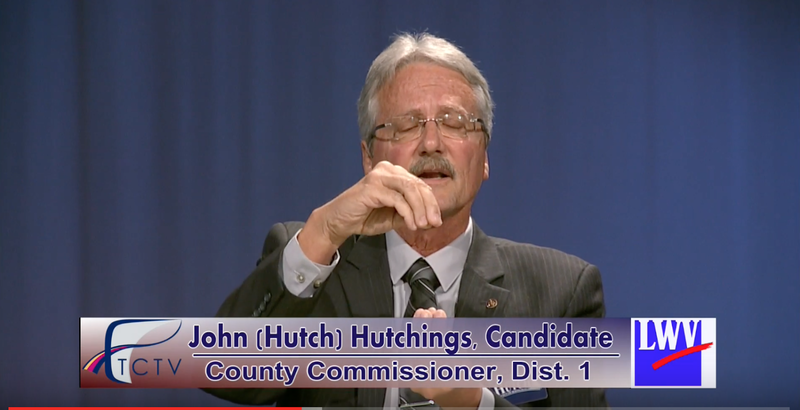 By this point in time, Hutchings or any candidate for county commission, should have their facts straight. Especially about such a hot topic (of which, there are many). This is reminiscent of Sarah Palin's multiple failed attempts to describe the duties of the vice president. It is ignorance bordering on an inability to grasp basic civics. Paired with Mr. Hutching's pathetically low ethical standards, this should disqualify him from being a county commissioner. Fantastically, this man claims to be a Fulbright Scholar. One minor point in his defense, however: unelected managers often wield undue influence over the otherwise democratic government's they are appointed to run. Look at Olympia. We have a city manager whose views are frequently at odds with the wishes of the voting public, especially on development issues. It is difficult to imagine Olympia electing a strong mayor as beholden to the agenda of the Chamber of Commerce and the Master Builders as Mr. Hall is. @James. I think if Steve Hall is beholden to the Chamber and the Master Builders, it isn't because they control his job, it's because the city council points him in that direction. Something I forgot to point out in the original post is that the city council can fire the city manager, they're his boss. If we don't like the way the city manager operates, we should vote in new councilmembers that will direct him otherwise.